A general-purpose HD-SDI input and output, both ASI capable. A relay automatically connects input port to output port upon software- or hardware failures, enabling highly-available system configurations without requiring a failover switch. HD-SDI/ASI input+output with relay bypass for PCIe with StreamXpert Lite and StreamXpress player software. HD-SDI/ASI input+output with relay bypass for PCIe with StreamXpert 2.1 stream analyzer and StreamXpress player. 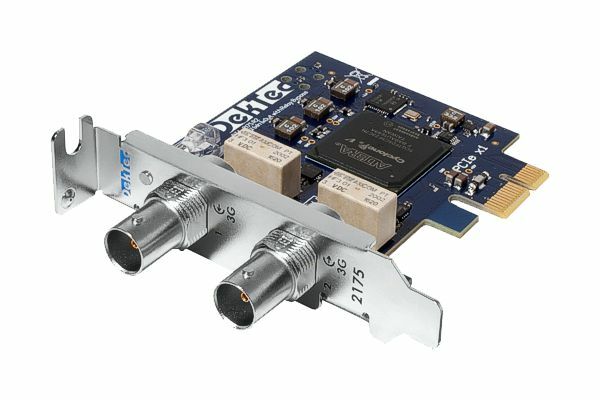 HD-SDI/ASI input+output with relay bypass for PCIe with SdEye and StreamXpert 2.1 stream analyzer and StreamXpress player. HD-SDI/ASI input+output with relay bypass for PCIe with VF-REC stream recorder, SdEye and StreamXpert 2.1 stream analyzer and StreamXpress player. General-purpose input and output port that can be independently programmed to operate in HD-SDI, SD-SDI or DVB-ASI mode. Relay automatically connects input to output upon application crash or PC power failure. 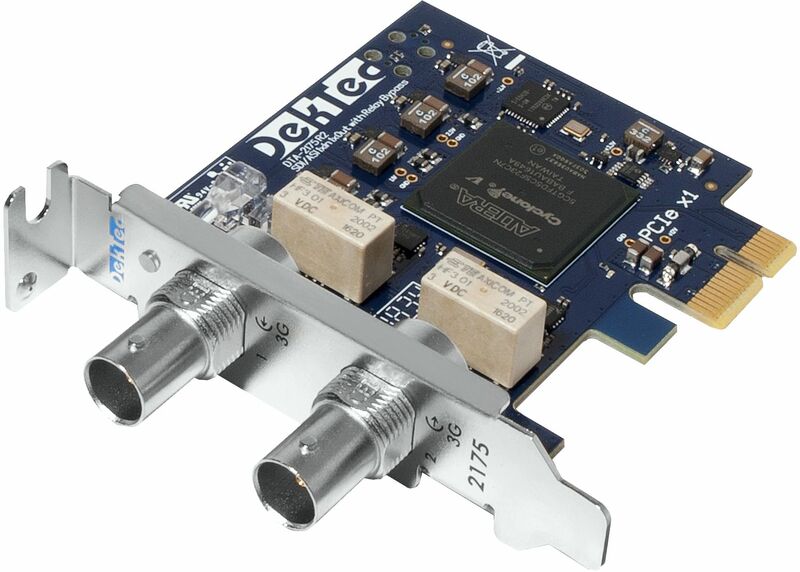 DekTec Matrix API® 2.0 provides convenient access to video, audio and ANC-data. Low-latency extraction and/or insertion of video-, audio- or ANC data, e.g. logo/subtitle inserter, audio embedder, etc. Analyze Transport Streams with StreamXpert. SDI and ASI input flows from port 1 through equalizer, deserializer, processing (encoding in a format suitable for transmission to PC) and DekTec's highly optimized DMA controller. The output flow to port 2 is very similar, but in the other direction. If the PC power fails, or the watchdog times out, the relay falls back to its inactive position, connecting the input directly to the output. The relay bypass on the DTA-2175 enables a simple though effective way to create a highly-available HD-SDI (or ASI) generator as shown in the diagram below. Both PCs run the same application. Normally, HD-SDI output originates from PC1. If PC1 fails (software crash or power failure), the relay will automatically fail over to PC2, bypassing PC1. The Matrix-API framework decodes incoming SDI data into pixels (in a programmable format), audio samples and ANC data structures. When a new frame has been received, the framework calls a user-supplied "frame-processor callback" for processing of the data. The user callback can create output video, audio and ANC data. which is encoded by the framework into SDI frames. The DTA-2145 is the predecessor of the DTA-2175. It supports ASI and SD-SDI, but not HD-SDI. Four bi-directional 3G-SDI/ASI ports and analogue genlock input, but no relay bypass. Twelve bi-directional 3G-SDI/ASI ports and analogue genlock input, but no relay bypass. Uses a high-speed PCIe gen3 x16 slot for ample bandwidth.